Jottacloud on iOS works with iCloud Photo Library. This means that we will back up ALL your photos if you have enabled iCloud Photo Library on your iOS device. Even the ones you store on iCloud. When you turn on iCloud Photo Library on your iOS device, Jottacloud will display and back up all photos stored on your iCloud account. 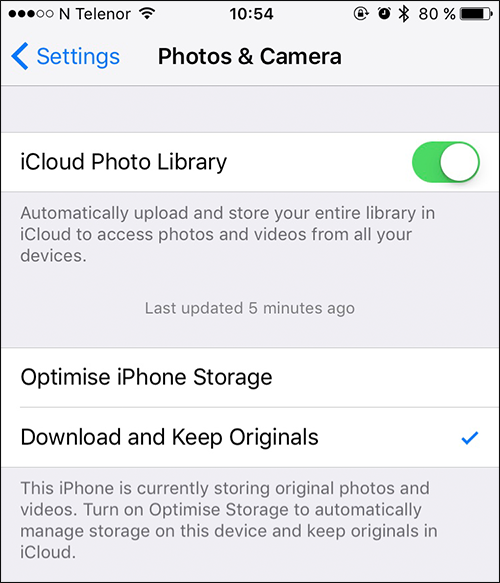 iCloud gives you the option to Optimise iPhone Storage which mean that iCloud will replace the original photos and videos with optimised lower-resolution versions. The Jottacloud app will have to download the originals before the app will back them up to Jottacloud. Backup will be slower and more data will be transferred. In this case we recommend doing uploads only when connected to WIFI. Even if the photo have been uploaded to Jottacloud before (i.e. from another device or our old app), we still need to download the original to checksum the file and verify that it is already uploaded. We will not upload files that are already uploaded. If the iCloud storage is bigger than the device storage, the device will run out of space. Please read more below. If you want to backup your files with both iCloud and Jottacloud, we recommend that you chose the Download and Keep Originals options. This means the original files are already stored on your iOS device and this makes backups in Jottacloud a lot faster. An alternative to migrating on your phone, is to backup the iCloud photos on your Mac.